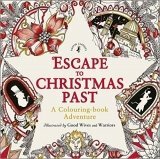 Escape to Christmas Past is a colouring book filled with highly detailed line artwork that brings to life A Christmas Carol in an entirely unique way. Evocative scenes and characters from Charles Dickens' famous story of Ebenezer Scrooge and Marley's ghost, threaded with imaginative, delicate patterns all clearly outlined in pen and ink, make ideal compositions to colour. Pivotal extracts from the story are scattered throughout for inspiration, and there are spaces left within some of the compositions for individual design and embellishment. This is a highly original colouring book for older children and adults alike. Handy-sized square format, easily portable - take it anywhere!